Authors: Suess, R. J.; Jadidi, M. M.; Murphy, T. E.; Mittendorff, M.
Abstract: We present polarization-resolved transient transmission measurements on multi-layer black phosphorus. Background free two-color pump-probe spectroscopy measurements are carried out on mechanically exfoliated black phosphorus flakes that have been transferred to a large-bandgap, silicon carbide substrate. The blue-shifted pump pulse (780 nm) induces an increased transmission of the probe pulse (1560 nm) over a time scale commensurate with the measurement resolution (hundreds of fs). After the initial pump-induced transparency, the sign of the transient flips and a slower enhanced absorption is observed. 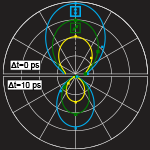 This extended absorption is characterized by two relaxation time scales of 180 ps and 1.3 ns. The saturation peak is attributed to Pauli blocking while the extended absorption is ascribed to a Drude response of the pump-induced carriers. The anisotropic carrier mobility in the black phosphorus leads to different weights of the Drude absorption, depending on the probe polarization, which is readily observed in the amplitude of the pump-probe signals.